Psychotherapist Claudia Baldeo has been working with refugee children at Ankyra, Center for Intercultural Psychotherapy in Tyrol since 2009. 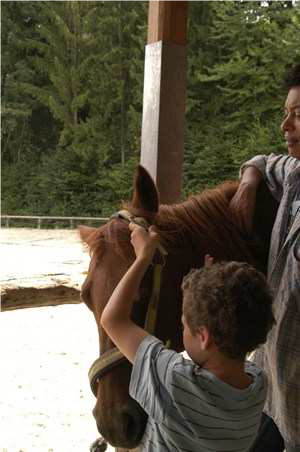 Her experience is that animal therapies like the Riding therapy, helps refugees to win back their basic confidence in the world and society. To express traumatic experiences in words is for adults sometimes hard enough. For children this is sometimes quite impossible. Therefore, therapy forms with animals are especially good for refugee children, even if they are well integrated. Aside from the School day, these children have experienced another reality of flight and violence, which they cannot share with their school colleagues. Equestrian therapy makes it possible for the refugee children to stay in spaces which otherwise tend to be closed and are shielded. "It is also good for the Tyrolean to join refugees", Baldeo is convinced. "Children are good ambassadors because they are better at overcoming barriers", she adds. The children should relax with the horses, enjoy their leisure time, and have a good experience, which also afterwards, stays as a pleasurable memory. Also, language difficulties can be forgotten for a while in communication with horses. Baldeo describes the effect of working with horses: "Horses are strong communicators and react sensitively to body language. Feeling being carried the children re-enter the world, and that is important for the development of trust. In the therapy nothing is demanded by the children, they only get offered a protective frame." The horses, which are used in riding therapy, must have a benign and calm nature, be reliable, stress-resistant and appealing to children. As sensitive creatures they are perfectly capable to distinguish between horseback riding and riding therapy. Baldeo: "Horses instinctively act more cautiously in contact with children and take a protective attitude. In addition, horses realize the neediness of people. In the case of refugee children, horses therefore take "a double protection".